The Green Bay Packers were struggling at 3-5 as they faced the division-rival Minnesota Vikings on November 6, 2000. While Head Coach Mike Sherman’s team still had star QB Brett Favre, very much in his prime at age 31, there were questions at running back, where veteran Dorsey Levens was out with an injury and backup Ahman Green, new to the team after two nondescript years with Seattle, was not yet established in the offense. WR Antonio Freeman appeared to be on the downside of his career and the rest of the receivers were ordinary. While the defense was not bad, it would be severely tested against Minnesota’s outstanding receivers. The Vikings, under Head Coach Dennis Green for the ninth year, had a 7-1 record, having lost for the first time at Tampa Bay the previous week. Second-year QB Daunte Culpepper was easing successfully into the starting role and was helped by the presence of two outstanding wide receivers in Cris Carter and Randy Moss. RB Robert Smith was also highly productive. However, the defense was a cause of concern. There were 59,854 fans in attendance for the rainy Monday night encounter at Lambeau Field. The Packers had first possession and punted. On Minnesota’s second play, Daunte Culpepper threw to Randy Moss on a slant and, after evading two tackles before being caught by DT Santana Dotson 20 yards down field, he lateraled to Cris Carter for an additional eight yards. A pass to Carter and two carries by Robert Smith advanced the ball to the Green Bay nine. On third-and-goal, Culpepper scrambled for an apparent touchdown, but it was nullified due to a personal foul penalty and the Vikings had to settle for a 30-yard Gary Anderson field goal. Green Bay put together a 15-play, 81-yard drive that extended into the second quarter. Favre connected with Antonio Freeman for 20 yards on a third-and-five play and WR Bill Schroeder ran for 12 yards on a reverse that was helped by Favre’s block on LB Dwayne Rudd. Following a 15-yard completion to Freeman to get to the Minnesota five, the Packers couldn’t reach the end zone and Ryan Longwell kicked a 24-yard field goal to tie the score. Key calls by the officials played a role in Minnesota’s next series. First, Culpepper was sacked by DT Russell Maryland, but an apparent fumble that was recovered by the Packers in the end zone was overruled with the officials explaining that the quarterback’s knee was already down. Then, on a third-and-19 play, a taunting penalty on CB Mike McKenzie gave the Vikings a first down. Smith ran for 22 yards and Culpepper threw to Moss for a 42-yard gain to the Green Bay 20. Another short pass was followed by a throw that Carter wrestled away from McKenzie for a five-yard TD. The series had gone 84 yards in eight plays and Anderson added the extra point to make it 10-3 in favor of the visitors. The Packers came back with an 87-yard scoring drive. 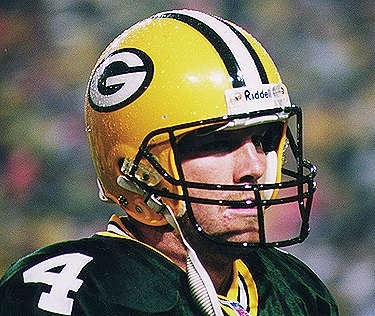 On the second play, Favre (pictured below) threw to Freeman for a 33-yard gain. An interference call on CB Cris Dishman added another 28 yards and, two plays later, Favre rolled out and, as he was being pulled down around the waist by LB Ed McDaniel, he flipped a pass underhand to Ahman Green, who caught the throw just inside the end zone for a touchdown. Longwell’s PAT once again made it a tie score at 10-10. With time running out in the first half, the Vikings went 57 yards in nine plays. They converted in a third-and-eight situation when Moss out-jumped FS Darren Sharper to catch a Culpepper pass for a 33-yard gain. Two plays later, a screen pass to Smith gained 22 yards to the Green Bay 30. The drive came up dry at that point, with three passes falling incomplete, and Anderson booted a 48-yard field goal as the half ended to give the Vikings a 13-10 lead at the intermission. In the third quarter, the Packers got a break on defense when McKenzie intercepted a Culpepper pass and returned it 26 yards to the Minnesota 34. They were able to advance 21 yards in six plays and Longwell kicked a 31-yard field goal to again knot the score at 13-13. Minnesota came right back with a 73-yard drive. Smith gained 13 yards on a sweep and Culpepper, flushed out of the pocket, ran for nine yards to the Green Bay 38. However, the series stalled but, facing third-and-17, Culpepper tossed a swing pass to Smith that the running back took all the way for a 45-yard touchdown. Anderson’s extra point had the Vikings back up by seven. The Packers responded with a big play when CB Allen Rossum returned the kickoff 90 yards to the Minnesota two yard line. Two plays later, Green powered over for a TD from that distance and, adding Longwell’s kick, the score was tied once more at 20-20. In the fourth quarter, Green Bay got the ball back following a punt when RB David Palmer fumbled on the return and long snapper Rob Davis recovered at the Minnesota 35. However, the Packers were unable to capitalize on a series in which Favre was sacked for a 12-yard loss. Green Bay had another shot when a pass interference call on CB Robert Tate was good for 28 yards, but Schoeder dropped a third-and-seven throw in the end zone. The Packers passed up a long field goal attempt into the wind and the resulting punt went into the end zone for a touchback. The Packers got the ball back in their own territory, couldn’t move, and had to punt, with Josh Bidwell’s kick going only 25 yards. Starting from the Green Bay 48, Culpepper threw to Moss for 19 yards and, with time running out, the Vikings lined up for a 33-yard field goal attempt by Anderson to win the game. But holder Mitch Berger couldn’t handle the snap cleanly and had to abort the kick. Rolling out to his right – and apparently forgetting that it was only first down and he could have thrown the ball away, with the team then able to attempt another kick – he tossed a desperation pass down the field that was intercepted by CB Tyrone Williams as time ran out. With the score still tied at 20-20, the game headed into overtime. The Packers had the first possession in OT. They converted a third-and-nine as Favre threw to Schroeder for a 22-yard gain. Two runs netted six yards and, on a third-and-four play, Favre went deep for Antonio Freeman, who was well-covered by Cris Dishman. Freeman slipped on the slick turf and fell as Dishman muffed a potential interception, and the ball fell onto Freeman’s left arm (pictured at top). The receiver pulled it to his chest and, jumping up, got past SS Robert Griffith and sped to the end zone where a wild celebration ensued. Green Bay won in astonishing fashion by a score of 26-20. The Vikings significantly outgained Green Bay (407 yards to 298) and had the edge in first downs (22 to 19). However, Minnesota turned the ball over five times, while the Packers suffered none. The Vikings were also penalized 11 times at a cost of 129 yards, to 8 flags for 63 yards on Green Bay. Brett Favre completed 17 of 36 passes for 235 yards and two touchdowns with none intercepted. Antonio Freeman had 5 catches for 118 yards and the game-winning TD and Ahman Green also had 5 pass receptions, for 34 yards, to go along with his 68 rushing yards on 23 carries. He scored two touchdowns, one rushing and one receiving. Bill Schroeder contributed four catches for 63 yards. For the Vikings, Randy Moss had four catches for 103 yards in the first half despite Green Bay’s concentrated attempt to stop him, but was marginalized in the second half and ended up with 6 receptions for 130 yards. 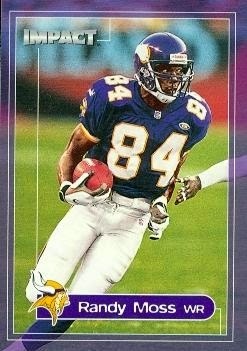 Cris Carter added 5 catches for 59 yards and a TD. Daunte Culpepper was successful on 17 of 34 throws for 276 yards and two TDs, but also tossed three interceptions. Robert Smith ran for 122 yards on 24 carries and had another 67 yards and a score on his two catches. The Packers lost the next week but finished strong by winning five of their last six games (including another victory over the Vikings). They ended up third in the NFC Central with a 9-7 record. Minnesota recovered to win four straight games before losing three to finish out the regular season at 11-5. That made them division champs and they beat the Saints in the Divisional playoff round before being soundly beaten by the Giants for the NFC title. Brett Favre had a relatively off year by his standards. He led the NFC with 580 pass attempts, completing 58.3 percent for 3812 yards and 20 touchdowns as opposed to 16 interceptions. Antonio Freeman caught 62 passes for 912 yards and nine TDs. Ahman Green performed well in the second half of the year and, in addition to leading the team in rushing (1175 yards), he also had the most pass receptions (73). It set the stage for bigger years to come as he topped the thousand-yard rushing mark in six of his first seven years with the club. Daunte Culpepper went on to tie for the NFL lead in touchdown passes (33, along with Peyton Manning of the Colts) while throwing for 3937 yards and a fourth-ranked passer rating of 98.0. He was selected to the Pro Bowl for the first time. So was Randy Moss, who was also a consensus first-team All-NFL honoree as he caught 77 passes for 1437 yards and a league-leading 15 receiving touchdowns.